LED Lighting Simplified. Many homeowners and business owners face the question of how best to light this space or that space. Ian's post to the Hartert-Russell-Home.com blog helps to address that question. LED lights are taking over the architectural world – they are long lasting (40-50,000 hours), they have low power consumption yet are powerful, generate very little heat (unlike their halogen and xenon counterparts), and available in a multitude of colors. LED lighting is being used in drawers, work spaces, as background lighting, in living rooms, bedrooms, closets, and of course, in the kitchen. If you do not wish to indulge in trying to figure out which driver should go with which light and how to integrate a dimmer, there are LED kits available that mix and match this for you and allow you to choose from a variety of different LED lighting options – here is an excellent choice from our list of recommended packages. Like all lighting, LED lights have different sizes, measured in wattage – here is a simple chart comparing LED lights to compact fluorescent and incandescent light bulbs. As you can see the watts of the LED lights seem, at first glance, surprisingly low, but pay attention to its equivalent in regular light bulbs (incandescent). Environmentally speaking, LED lights use a fraction of the power that a standard incandescent light bulb uses while providing the same wattage and does not have the environmentally threatening mercury in them, like CFLs do. 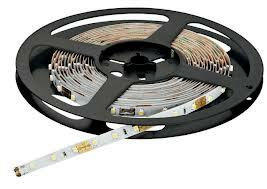 LED lights come in a variety of sizes and shapes - surface mounted fixtures, puck style round down lights, and ribbon lights (also known as rope, tape or strip lighting). Each of these have a wattage associated with the fixture(s) that then has to be matched up to a suitably sized driver – for example, if you have 3, 3 watt LED lights, you will need a driver that can drive a minimum of 9 watts of power. Surface mounted LED fixtures are incredibly useful and elegant. 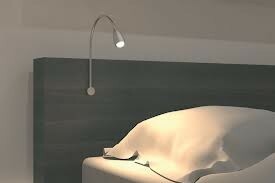 One example of this is a flexible reading light (see picture below). These are available in a surface mounting bracket (that simply screws onto any surface) and a mounting bracket that requires a small hole to be drilled in order to conceal the wiring . Both of these kits include everything you need and are available in one and two lighting kits. 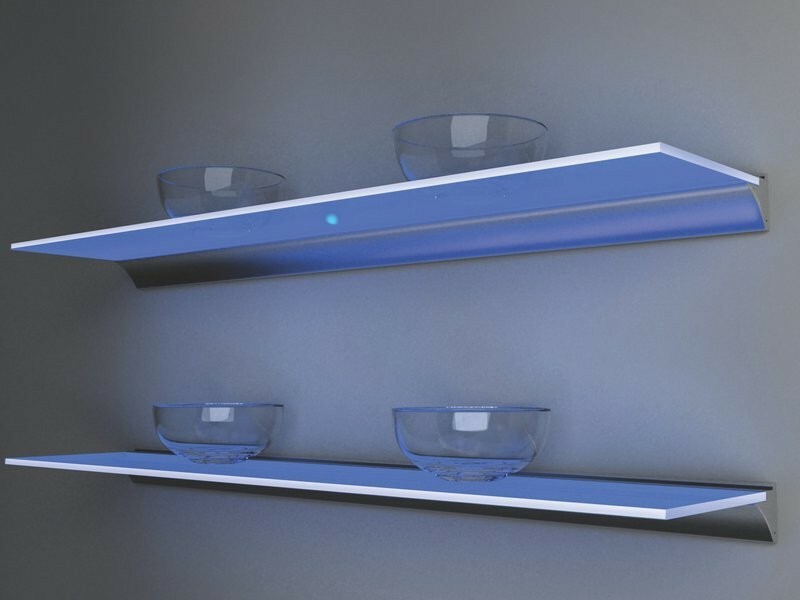 A glass illuminated shelf fixture is also a popular item – giving a floating shelf look while also illuminating LED lighting through the edge of the glass (see picture below). This kit also includes everything you need and are available in one and two shelf kits. 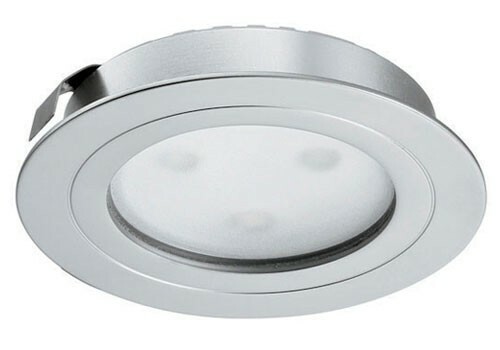 Puck style, round down lights are incredibly versatile and are replacing the old fluorescent, halogen, and xenon counterparts. Again they don’t get hot, use less electricity and come in a variety of sizes and shapes. These LED Pucks are incredibly low profile and clips into a hole for easy installation – see the clip that provides a pressure fit revealing only the small 1/32” lip (see picture below). This kit gives you options of warm or cool white (warm white looks more like the amber glow of an incandescent while the cool white gives a pure white (almost blue) light. This kit includes one recessed light with the options of warm or cool light color and available in nickel matt or black finish, one switch that fits your needs, one LED Driver, and one Power Cord. A three-light kit is also available. 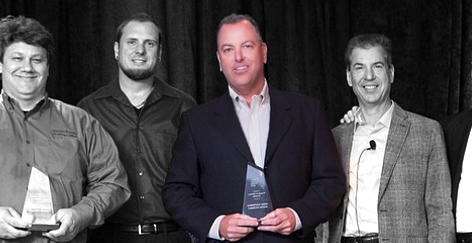 Ribbon lights (see picture) are incredibly versatile for task lighting and background lighting. It comes with a peel and stick backing, making it easy to install – it also has an option to be installed in a sleek aluminum diffuser. This is a favorite to many electrical contractors as it also has the ability to dim – here is a kit that is a favorite to Kerr Electric. These kits are also available without the aluminum diffuser and with a dimmer making them adaptable to your lighting needs.